PASS has positioned itself as a leader in the image storage and delivery market since the beginning of digital delivery. 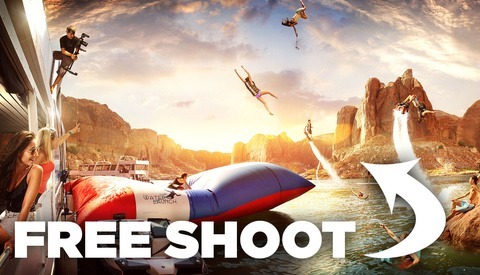 With the launch of the Shoot and Share business model, the team has quickly created a product that both photographers and their clients have been asking for. The new PASS mobile app is sure to bring even more joy to those photographers and clients! Let me be clear about my perspective on this app and the Shoot and Share team. I am in no way affiliated with PASS and/or Shoot and Share, and I have never worked for or made any money from them, including with this article. I am however a huge fan and power user of their products, and I stand behind them and their products. The community that has been built around the Showiteer community and now the Shoot and Share community has invested hugely in my business and I owe a huge debt of gratitude to all of the photographers in those groups! I want to share my thoughts on the new app and the PASS system in general from two points of view: the Client’s and the Photographer’s. My clients are loving PASS because it’s a great way for them to View, Share and Store their images. Here’s how the PASS mobile app will affect the client experience. Something my clients used to always ask me about was how to get their photo on their iPad and iPhone. I would constantly be acting like an apple support tech trying to give my clients the best service possible. The problem was that in order to get a large number of photos on to your mobile device you had to have them in a folder on your computer and then use iTunes or something other means of syncing them to your laptop. This is not really that difficult of a process, but I found countless clients that just couldn’t understand it, and were confused as to why it was so difficult. “Can’t I just save them from the website right to my iPad?” I would hear this all the time, and now I can finally say YES!! To view your photos It’s as simple as logging in to your account! There are two ways to get an event associated with your account so you can view the photos. 1 - The Photographer assigns you an account through your email address or Facebook account, and then you use that to login. 2 - You visit the web gallery of the event you want added to your account (eg. http://mattkennedy.pass.us/ryanandalanna ) and you click login from the left side menu. You can login to a pre-existing account, or create a new one through either your Facebook account (easiest) or by using an email and password. Once you have an account associated with an event, you can view that event right on your mobile device (iOs and Android) through the brand new mobile app. This app will host all of the events you have associated with your account. For example, if you did an engagement session with me and then your wedding, followed by a Rock the Dress bridal session, you would have all three sessions in your PASS app, and you would be able to have them all saved to your phone in offline mode for instant access. Once you have your events connected with your account, you can click on the Menu button and select “Make Available Offline”. With this function, you can have your images saved within the PASS app to be viewable at any time on your app, even if you don’t have internet connection. The amazing thing is that your photos are saved in a size that is optimized for mobile, so your whole wedding gallery could potentially take up only 0.05 GB on your mobile device! This is incredible for the quality of photos you will have saved. 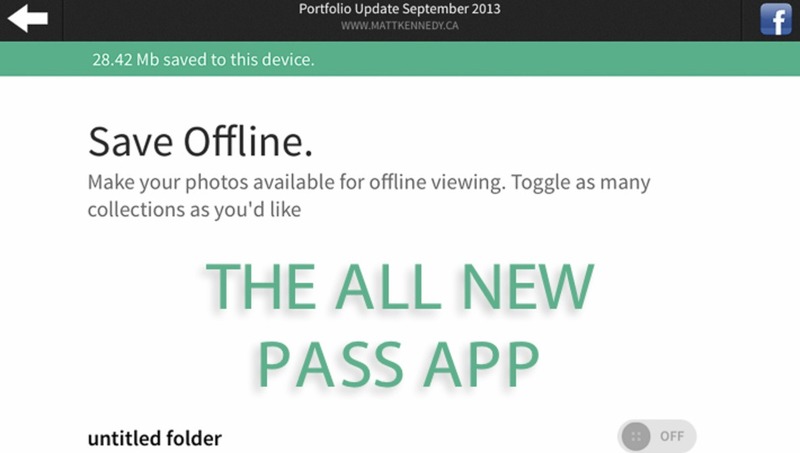 To view your photos once they are set to be available in offline mode, just open up the PASS app and start enjoying! One thing that you’ll notice when using PASS on the mobile app and on your computer is that the gallery is exactly the same and almost all functionality is in the app. The print feature will also be coming in another release of the app rumored to not be far off, but for now you can still use the actual web gallery from your mobile device web browser and access all of the printing features. 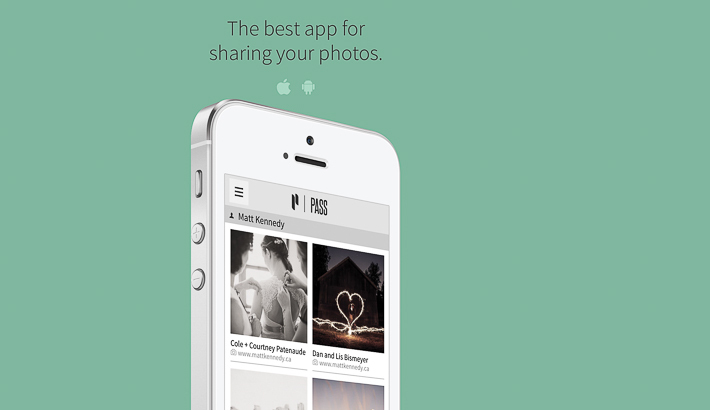 Sharing images with PASS and the mobile app is simple and very powerful. Your clients will be so thrilled with the simplicity of getting their images to their friends and family! You can share your entire gallery to Facebook easily by clicking on your favorite photo, then clicking on the + tab in the top right corner and selecting “Facebook” in the Share Photo section. This will open up a dialog box where you can write something about that photo or about the gallery, and then a link to your online web gallery will be posted to your Facebook timeline. 2 - Using a computer, download your favorites by clicking on the menu bar in the top left, selecting download all, and then selecting “My Favorites”. 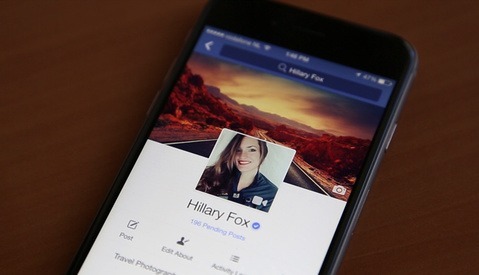 3 - Open up Facebook and click on your profile page, then click on the photos tab. 4 - Click on “+ Create Album” and choose the favorites folder that you just saved to your computer. This will upload the high-resolution images to your album so you get the best quality images possible, and they’re able to be tagged on Facebook. Some of your guests, friends and family may not be Facebook users, and you may want to share the gallery with them so they can view, save and print some of your photos. To do this, simply choose an image, any image will do, then click the + button to bring out the right side menu. Choose the “Email” option and your email app will automatically open up with the link to the image already in the message area of your email. Simply customize the email to whoever you’re sending it to and send away. They will be sent a link that brings up that individual photo and then they can click on the arrow button to reveal the rest of the public gallery. Pinning is easy with this app! 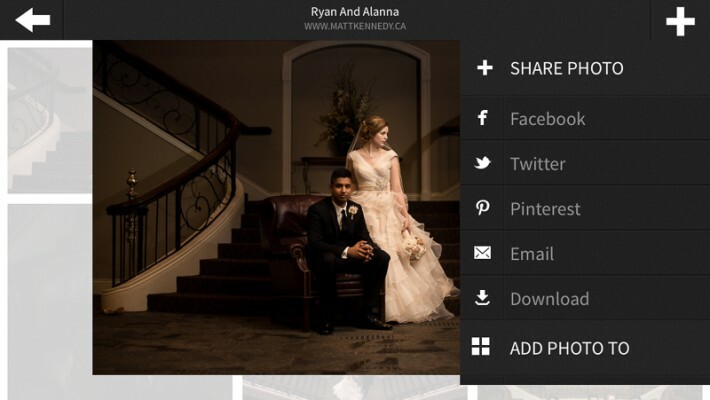 All you have to do is click the “Pinterest” button in the Share Photo menu and the Pinterest app will be automatically opened with the image ready to be pinned to whichever board you choose. The Photographer’s credit will also be placed in the description of the pin. Your clients can rest assured that their images are safe on PASS, and they don’t have to do anything to get them there. When you create an upgraded event ($29) and load the images into it, those images are active for 1 year with all of the sharing, viewing and printing capabilities available with PASS. After that 1 year, the images are saved in “cold storage” for 10 years, meaning that they are still safe and secure on the PASS servers, but are not accessible through the web gallery. They can be reactivated by purchasing another 1 year of the upgraded gallery for $29, and then the 10 years will also start again from that point on. I suggest to my clients that they consider additional means of storage for their own security, and many of them choose to save the photos from the web gallery to hard drives and/or USB drives and store them in a safe manner. We all know that the most secure form of long term storage of images is in print form, which is why I also have albums, prints, canvas, and other mediums that they can purchase if they would like. PASS has revolutionized my workflow as a photographer, and I’m so glad to be able to have a streamlined process that allows me to provide a great service to my clients, while maintaining reasonable working hours! While the mobile app doesn’t affect that workflow directly, there are some ways that it really does make a difference! Many of my clients have been wanting a better solution for their images getting to their phones, and because this app is allowing for that to be so simple, delivery of images is again a one-step process. My initial email to my clients explains how they can view, share and use their images on computer and mobile, and that’s it! No more explanations of tricky iTunes setups and zip folders of files. My piece of mind from having all of my images safely stored on PASS is priceless! My contract states that I’m not liable for storing their images after their initial delivery, but I do appreciate the built in ability to have their images saved and accessible if need be. 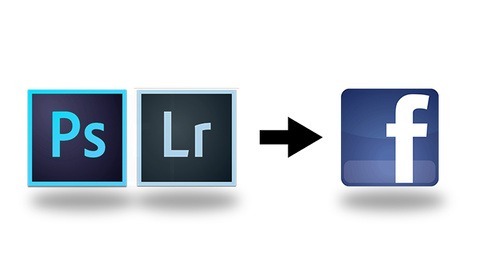 I use PASS for storing images from Wedding clients, portrait clients, events, and even personal photos. Something that the new PASS app has made available to us now is the accessibility of our entire portfolio at our finger tips at all times. It is a great idea to also create your own portfolio event that you can store your favorite images in for the cases when you’re needing to show someone in person, or you need to send someone your best work. 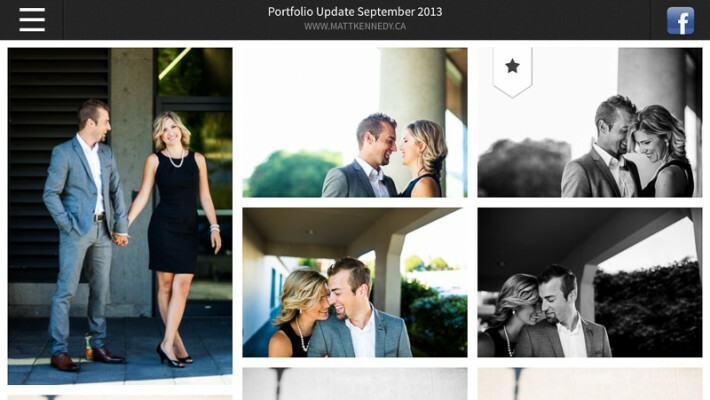 I highly suggest having you few favorite weddings saved in the offline mode, as well as your portfolio and bio images. This will allow you to have your portfolio in your pocket wherever you go! I am excited about this app, and especially about where I see it going in the future as well! Click here to download the app and try it out for free on iOS or Android! Remember, creating a PASS account is free, and you can share free 30 day events as much as you’d like. Give it a try! If you need to create a free PASS account, click here. Seems they are finally getting some of the features of the "big boys" - now they need to get a clue on pricing. Zenfolio users can already do all of this, for an unlimited number of customers all year - starting from less than the cost of just 2 of these Pass galleries - and I'm fairly sure SmugMug users can as well. Collages.net also offers something similar for $8 an event. They call it "Digital Brag books"
This article would have appeared much less biased had it not been written from someone so closely tied to the Showit business. However, PASS is truly one of, if not the most elegant solution for gallery viewing on a phone though current limitations such as their fixed print price model does appeal more to the average consumer. Showit has been significantly improving their image of late. Now what we need is for it to come up with a legitimate solution to managing clients (ala ShootQ) with the elegance of their other software tools. I don't agree with their business practices. I voiced my opinion in a piblic group on facebook and had the owner David Jay attack me personally. I don't agree with their business practices. I voiced my opinion in a public group on facebook and had the owner David Jay attack me personally. He doesn't care about customer service and doesn't mind offending a paying customer. I suggest spending your money elsewhere. Guess which proofing system provides mobile apps at no extra cost?